Less than 72 hours after the conclusion of the Wednesday night information meeting conducted by the Wilton Rancheria on their $400 million casino proposed for Elk Grove, an anti-casino mailer started appearing in mailboxes. 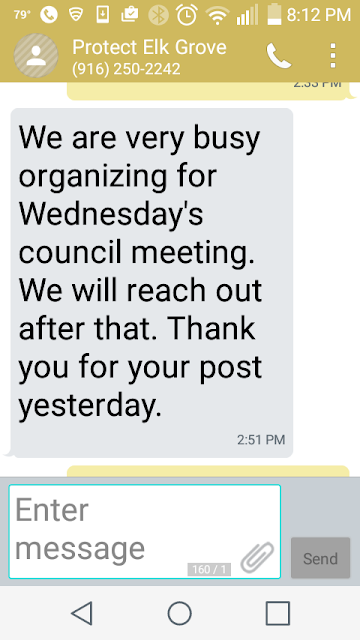 A text message sent did receive a response that said "We are very busy organizing for Wednesday's council meeting. We will reach out after that..."
If the group draws people to Wednesday night's Elk Grove City Council meeting and they speak during public comment for non-agenda items, we will have a better idea who has targeted Elk Grove Mayor Gary Davis for their apparent opposition to the proposed casino. Thank you for the tip runavajo. The mailer indicated that small businesses in Elk Grove would be hurt, but I think that small businesses can only benefit from a large influx of jobs and income into Elk Grove. I live in Elk Grove, and I support the casino locating here.